Ben's two (I know, how did that happen?!) and a whole lot of fun, which (mostly) makes up for the fact that he wakes up at 5:00 a.m. Dave and I are reliving stuff that we enjoyed with Max and Sabrina when they were younger—taking him on train rides, having dance parties in the living room, pushing him on the swing in our backyard, reading to him at bedtime as he cuddles on our laps. 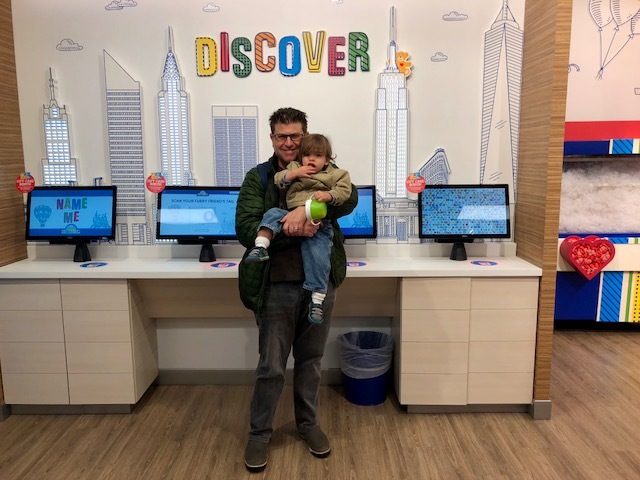 Last Friday, we added another thrill to our list when we took Ben to the grand opening of Build-A-Bear in New York City, sponsors of this post. We had the best time watching him have the best time. 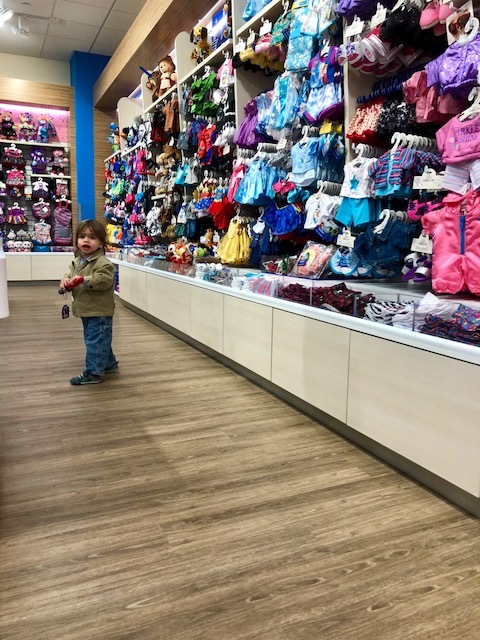 At first, Ben did laps around the store, checking out the furry friends, outfits and accessories. 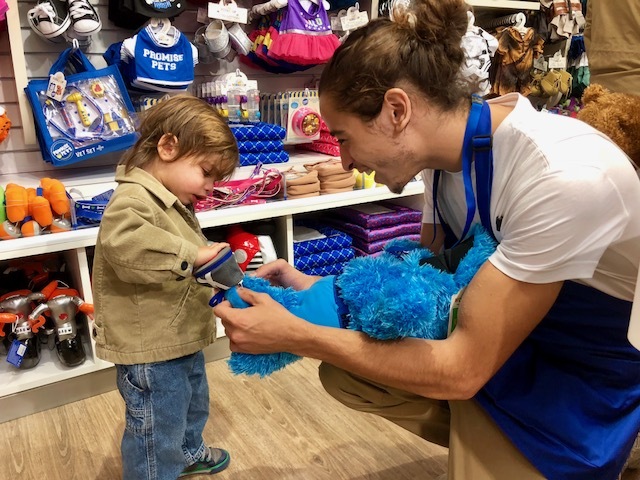 Dave offered Ben a bear with a Jets outfit, but Ben took an instant liking to Cookie Monster...all of them. 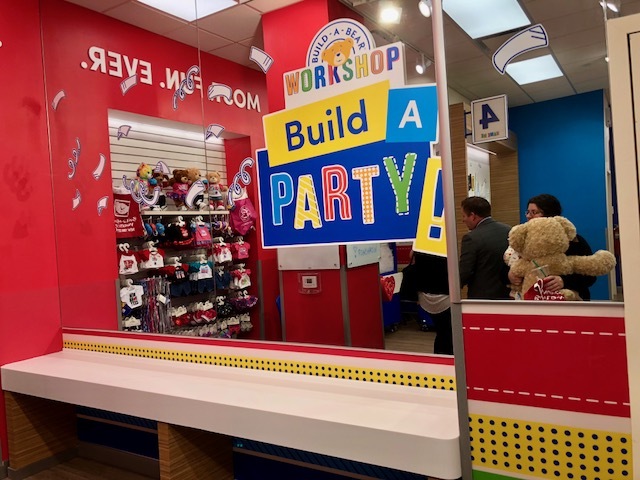 Happily, Build-A-Bear Workshop is the kind of place where it's OK to kid-handle bears and/or accidentally spill your crackers all over the floor (not that I know any child like that). 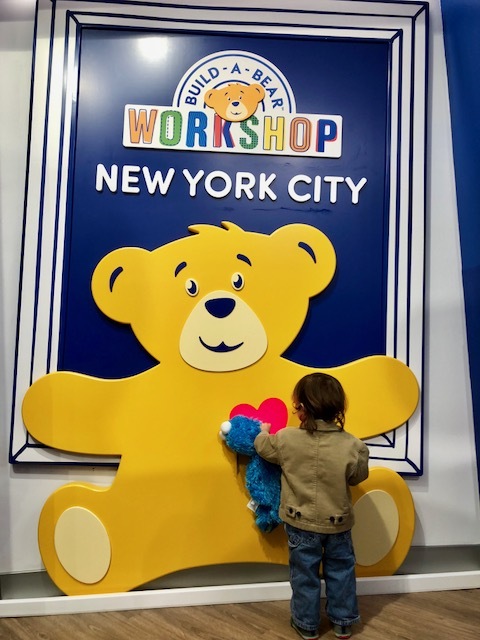 It's also the kind of place that inspires your child to bring his bear to the one on the wall for a kiss. "What's that?!" Ben asked, pointing at the gigantic stuffer. It can stuff up three bears at once. 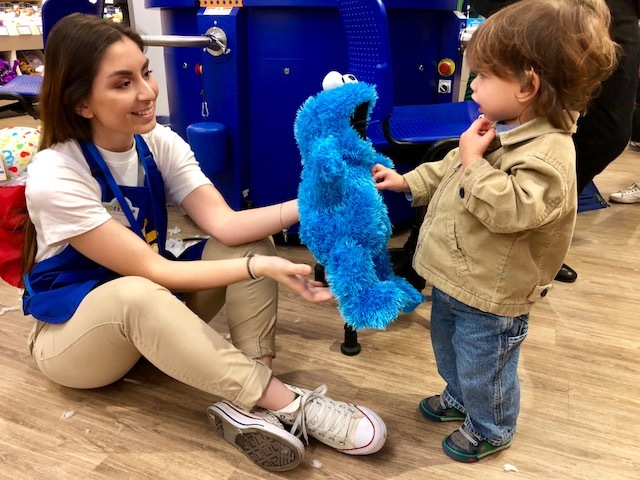 "That's how we're going to make Cookie Monster big!" I explained. "Big boy!" he said. I remember being so excited when Max filled up his first bear and grasped it with both hands, never an easy feat for him. The Bear Builder helping us, Sonia, offered up a scent (chocolate!) and a Cookie Monster 6-in-1-Sound (yes, please! ), activated when you squeeze Cookie's hand: "Cookie Monster here! Me so happy to see you! Me love cookies nom nom nom! Me love playing with you! Ooh hello!" 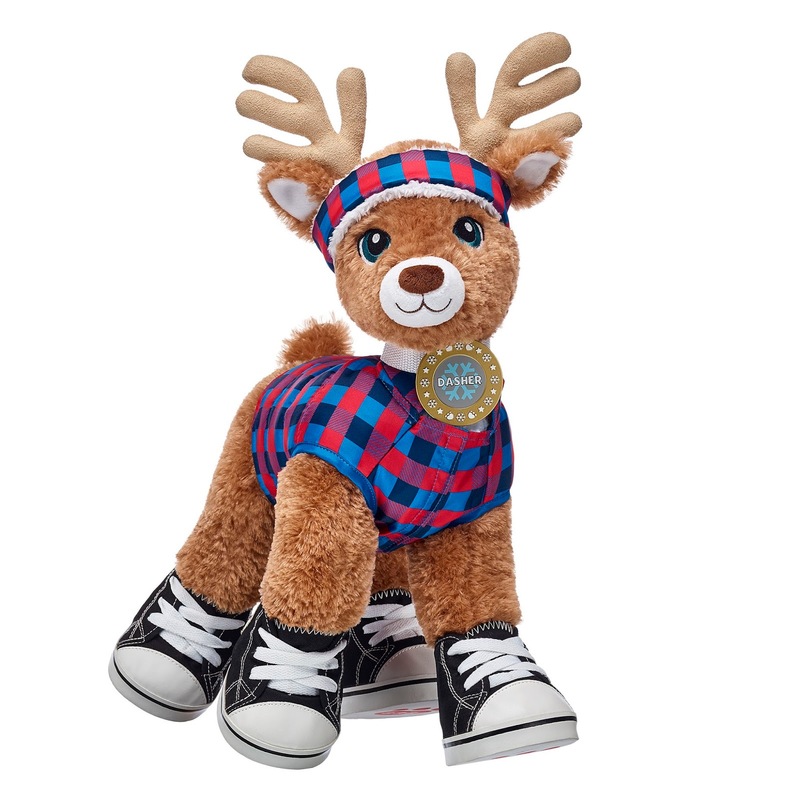 Hey, Build-A-Bear, just a suggestion but I think Cookie should also say: "Please don't throw your pasta across the kitchen!" and "You need to stay in your crib till 7 a.m.!" I'd been looking forward to the heart ceremony, the part where kids blow on the heart to warm it up then place it in their bear. Except Ben liked the heart a little too much. Once Ben reluctantly left the heart in Cookie Monster, Sonia sewed him up and voila! 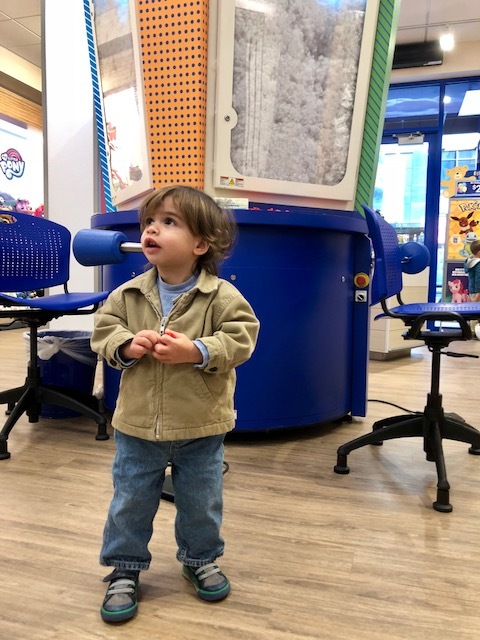 Ben's first Build-A-Bear. He was in awe. Afterward, we got a couple of outfits including a Jets one (of course! ), pj's and undies. Mason helped us pick out stuff, and did a far better job than me at putting on shoes. 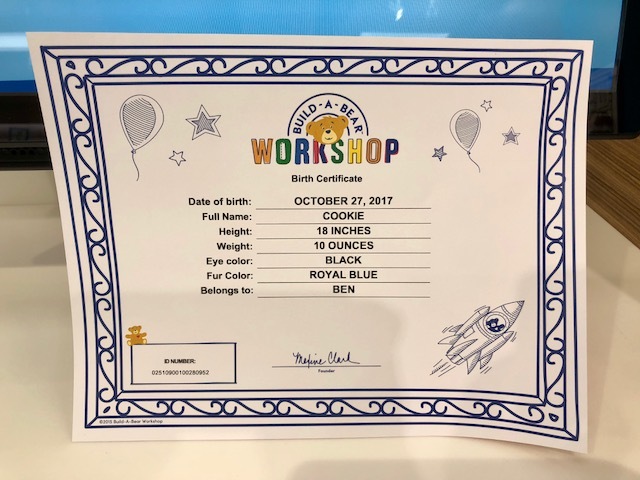 We printed out a birth certificate at the Discover station, and decided to name him...Cookie. Because we are creative like that. The new store is generally bright and cheerful, with room for parties. 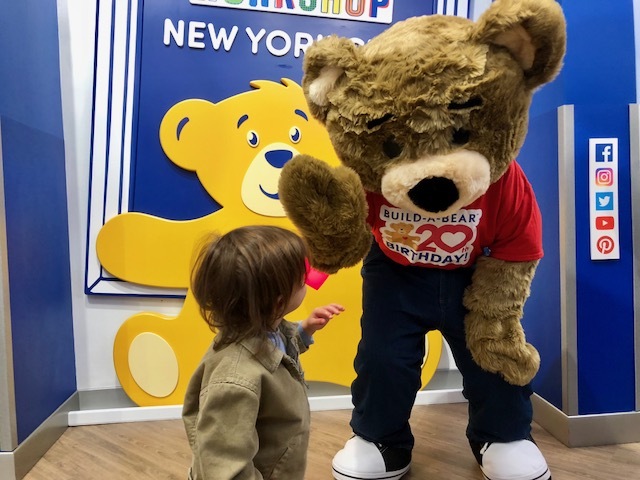 Build-A-Bear Workshop just celebrated its 20th birthday and in honor of that—true to the company's mission of adding a little more heart to life—it's donated 20,000 teddy bears that were distributed among two dozen children's hospitals around the country. How great is that? We left the store with Ben holding on tight to his new BFF. 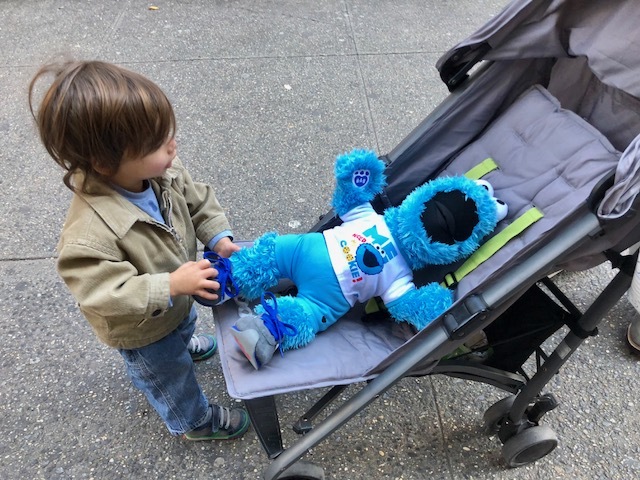 There was just one problem: Ben refused to get in his stroller. One guess why! 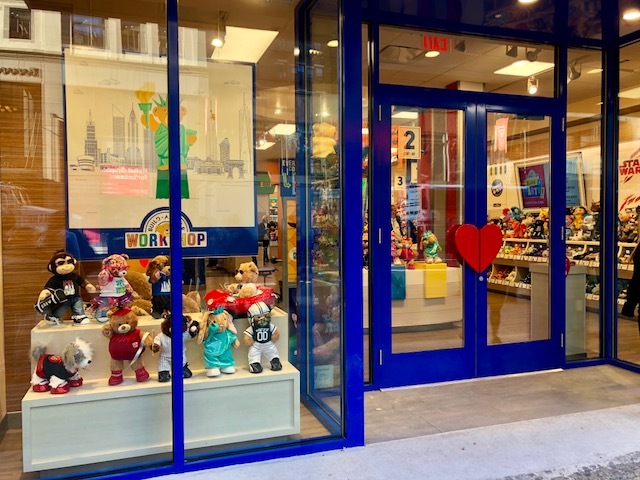 Build-A-Bear Workshop is located at 22 West 34th Street, between 5th and 6th Avenues, and is open Monday through Saturday from 10 a.m. to 9 p.m. ET and Sunday 11 a.m. to 7 p.m. ET. 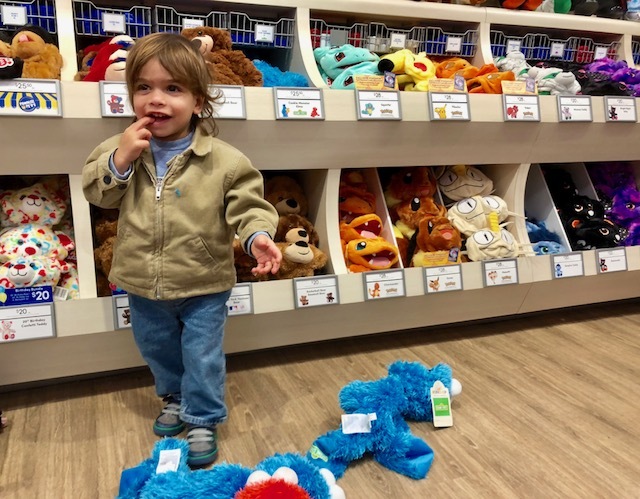 This is a sponsored post and I was compensated by Build-A-Bear Workshop. All thoughts and opinions are my own. I remember going to build-a-bear as a kid. Ben is so cute. And the things Cookie Monster should say. I think there are other Sesame Street characters who are more attuned to delayed gratification - eg. Ernie, Bert and the Twiddlebugs. [That whole inner-city apartment feel with the greystones and the courtyards were the real life scenes of Sesame Street especially on the big stairs where Big BIrd and Oscar the Grouch were]. 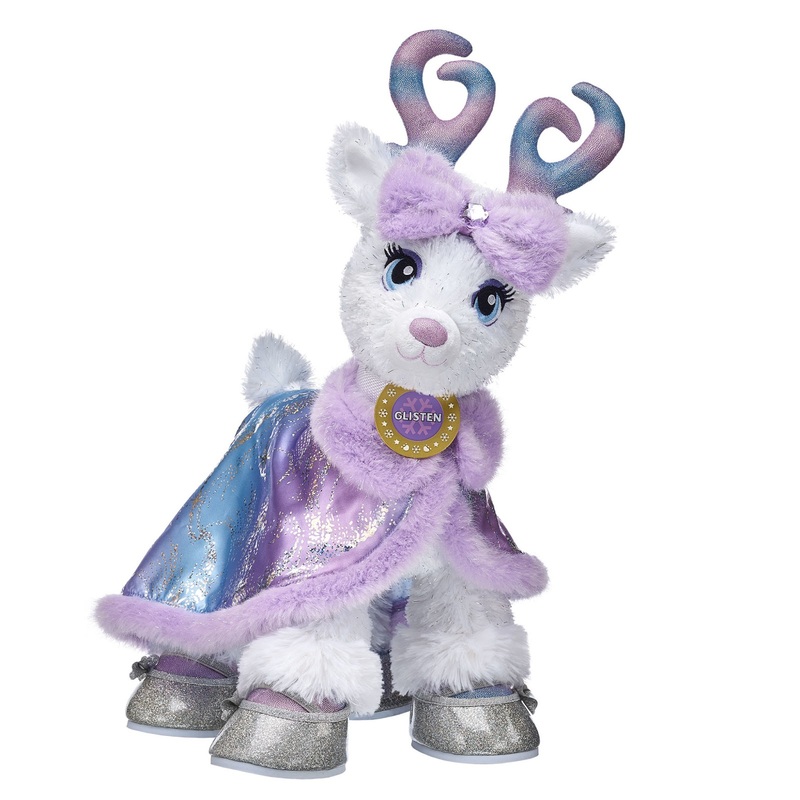 The reindeer would be good to leave at Christmas time. Last year some wooden reindeer came to my house and supervised the tree. They were very Nordic-style, and a two-year-old would probably enjoy them. And terrific to discover Mason and his shoe powers. And Sonia and her heart-sewing-skills. Have Max and/or Sabrina considered working at Build-a-Bear? Maybe the IEP team would appreciate a pre-Christmas make-and-cuddle. 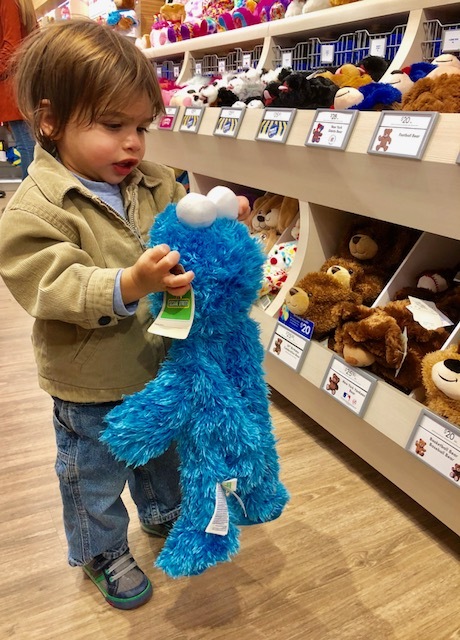 I've yet to take my kids to build a bear, but it's something I think they're both at the age for that they would really enjoy!